Uday B, Garg BK, Kathju S (2002) Effect of spacing on seed yield and physiological traits in moth bean (Vigna aconitifolia). Indian Journal of Agricultural Sciences 72(2), 76-79. Ueno T, Kuwahara Y, Fujii K, Taper ML, Toquenaga Y, Suzuki T (1990) D-Catechin: an oviposition stimulant of the azuki bean weevil Callosobruchus chinensis in the host azuki bean. Journal of Pesticide Science 15(4), 573-578. Ujjinaiah US, Narayanappa C, Prasad SR (1999a) Standardization of the seed testing procedure for rice bean (Vigna umbellata (Thumb)). Seed Research 27(1), 14-19. Ullah MA, Anwar M, Razzaq A, Zaidi SAR, Bano S, Abbasi KH (2007) Evaluation of Setaria anceps as affected by summer legumes in the Pothowar Plateau of Pakistan. International Journal of Biology and Biotechnology 4(2-3), 197-199. Ullah MA, Maqsood A, Razzaq A, Zaidi SAR, Bano S, Abbasi KH (2007) Evaluation of Setaria anceps as affected by summer legumes in the Pothowar Plateau of Pakistan. International Journal of Biology and Biotechnology 4(2/3), 197-199. Ullah MA, Tariq AN, Razzaq A (2007b) Effect of rice bean (Vigna umbellata) inter-cropping on the yield of perennial grass, Panicum maximum cv. Gaton under rain-fed conditions. Journal of Agriculture and Social Sciences 3(2), 70-72. Unfried K, Schiebel K, Hemleben V (1991) Subrepeats of rDNA intergenic spacer present as prominent independent satellite DNA in Vigna radiata but not in Vigna angularis. Gene 99(1), 63-68. Upadhyaya A, Davies TD, Sankhla N (1991) Epibrassinolide does not enhance heat shock tolerance and antioxidant activity in moth bean. Hortscience 26(8), 1065-1067. Upadhyaya A, Davis TD, Sankhla N (1991) Heat shock tolerance and antioxidant activity in moth bean seedlings treated with tetcyclacis. Plant Growth Regulation 10(3), 215-222. Upadhyaya A, Gehlot HS, Davis TD, Sankhla N, Sankhla A, Sankhla D (1989) In vitro growth, metabolism and regeneration of moth bean callus as influenced by flurprimidol. Biochemie und Physiologie der Pflanzen 185(3-4), 245-252. Vaishale A, Sadhana J, Seema K, Kishore P, Shashi C (1998) Effect of processing on phytate degradation and mineral solubility in pulses. Journal of Food Science and Technology (Mysore) 35(4), 330-332. Valdez-Cepeda RD, Mendoza B, Diaz-Sandoval R, Valdes-Galicia J, Lopez-Martinez JD, De Celis EMR (2003) Power-spectrum behavior of yearly mean grain yields. Fractals-Complex Geometry Patterns and Scaling in Nature and Society 11(3), 295-301. Vanaja M, Raju AS (2003) Integrated nutrient management in rice-sunflower cropping system in alfisols. Journal of Soils and Crops 13(2), 211-218. Vanaja M, Raju AS (2004) Residual effect of organic, bio and inorganic sources of nutrients on sunflower in rice-sunflower cropping system. Journal of Soils and Crops 14(2), 237-246. Vance CP, Boylan KLM, Maxwell CA, Heichel GH, Hardman LL (1985) Transport and partitioning of CO2 fixed by root nodules of ureide and amide producing legumes. Plant Physiology 78(4), 774-778. Varma BK (1995) Some observations on tannin content of rice bean (Vigna umbellata). Journal of Research, Birsa Agricultural University 7(1), 89-90. Varsha R, Chaudhari US (2002) Psychoactive effect of the leaf extract of Vigna trilobata Linn., on a fresh water fish Labeo rohita. Flora and Fauna (Jhansi) 8(2), 101-103. Vaughan D, Tomooka N, Xu R, Konarev A, Doi K, Kashiwaba K, Kaga A (2000b) The Vigna angularis complex in Japan. 159-176. Veer S, Yadava CPS (2001) Evaluation of some grain protectants against Callosobruchus maculatus on moth bean. Indian Journal of Entomology 63(4), 471-474. Vendruscolo ECG, Schuster I, Pileggi M, Scapim CA, Molinari HBC, Marur CJ, Vieira LGE (2007) Stress-induced synthesis of proline confers tolerance to water deficit in transgenic wheat. Journal of Plant Physiology 164(10), 1367-1376. Venkateswarlu B, Rao AV (1987) Quantitative effects of field water deficits on N2 (C2H2) fixation in selected legumes grown in the Indian desert. Biology and Fertility of Soils 5(1), 18-22. Vera-Núñez JA, Infante-Santiago JP, Velasco-Velasco V, Salgado-García S, Palma-López DJ, Grageda-Cabrera OA, Cárdenas R, Peña-Cabriales JJ (2007) Influence of P fertilization on biological nitrogen fixation in herbaceous legumes grown in acid savannah soils from the Tabasco State, Mexico. Journal of Sustainable Agriculture 31(3), 25-42. Verdoy D, Coba de la Peña T, Redondo FJ, Lucas MM, Pueyo JJ (2006) Transgenic Medicago truncatula plants that accumulate proline display nitrogen-fixing activity with enhanced tolerance to osmotic stress. Plant, Cell and Environment 29(10), 1913-1923. Verma DPS, Cheon CI, Hong Z (1994) Small GTP-binding proteins and membrane biogenesis in plants. Plant Physiology 106(1), 1-6. Verma DPS, Hu CAA, Delauney AJ (1993) Genetic manipulation for proline overproduction and the control of osmoregulation in plants. 47-58. Verma DPS, Kim JH, Wu T (1997) Assimilation of reduced nitrogen in tropical legume nodules: regulation of de novo purine biosynthesis and peroxisome proliferation. 205-209. Verma K, Khanna PP (1988) Hard seeds in legumes. Seed Research 16(2), 235-237. Verma P, Mehta U (1988) Study of physical characteristics, sensory evaluation and the effect of sprouting, cooking and dehulling on the antinutritional factors of rice bean (Vigna-umbellata). Journal of Food Science and Technology-Mysore 25(4), 197-200. Verma SK (1983) Host plants of Amsacta moorei Butler in the Rajasthan Desert. Bulletin of Entomology 24(1), 49-50. Verma SK (2006) Emerging insect pest problems of legumes in arid ecosystem. Journal of Arid Legumes 3(1), 65-69. Verma SN, Singh OP (1991) Rice bean Vigna-umbellata a new host of soybean girdle beetle Obereopsis-brevis S. Indian Journal of Plant Protection 19(1), 104. Vibha D, Simlot MM (1997) Effect of trypsin inhibitor on protein quality of black-soybean and mothbean meals. Journal of Food Science and Technology (Mysore) 34(3), 208-211. Vieira C (1977) Performance of rice bean (Vigna umbellata) varieties in Vicosa, Minas Gerais state Brazil. Tropical Grain Legume Bulletin(No.10), 20-21. Vieira RF, de Faria MN, Ramos JAD, Vieira C, Donzeles SML, de Freitas RTF (1998) Seed germination of six grain legumes during storage at room conditions in Vicosa, Minas Gerais State, Brazil. Seed Science and Technology 26(2), 489-499. Vieira RF, Nasser LCB (1997a) Performance of Phaseolus and Vigna species in the "cerrado" of Goianira, GO, Brazil. Cientifica (Jaboticabal) 25(1), 59-66. Vieira RF, de Santos CM (2000) Behaviour of rice bean cultivars in Ponte Nova, Minas Gerais state. Comportamento de cultivares de feijão-arroz em Ponte Nova, Minas Gerais. 47(273), 573-578. Vieira RF, Vieira C (1996c) Performance of beans of Vigna and Phaseolus genera in associated cropping with maize planted simultaneously. Pesquisa Agropecuaria Brasileira 31(11), 781-787. Vieira RF, Vieira C (2001) 'Grain legumes.' 206 pp. Vieira RF, Vieira C, Deandrade GA (1992) Agronomic comparison of beans Phaseolus and Vigna genera with the common bean (Phaseolus-vulgaris L). Pesquisa Agropecuaria Brasileira 27(6), 841-850. Vietmeyer ND (1986) Lesser-known plants of potential use in agriculture and forestry. Science, USA 232(4756), 1379-1384. Vijayakumar C, Khalak A (1993) Effect of rhizobium levels on growth, yield and economics of rice bean. Current Research - University of Agricultural Sciences (Bangalore) 22(9-10), 127-128. Vijayakumari K, Siddhuraju P, Janardhanan K (1997) Chemical composition, amino acid content and protein quality of the little-known legume Bauhinia purpurea L. Journal of the Science of Food and Agriculture 73(3), 279-286. Vijayakumari K, Siddhuraju P, Pugalenthi M, Janardhanan K (1998) Effect of soaking and heat processing on the levels of antinutrients and digestible proteins in seeds of Vigna aconitifolia and Vigna sinensis. Food Chemistry 63(2), 259-264. Vikal Y, Satija CK (1992) Cytogenetical characterization of wild and cultivated species of Vigna. Crop Improvement 19(2), 104-108. Vinh LT, Dworschak E (1985) Phytate content of some foods from plant origin from Vietnam and Hungary. Nahrung 29(2), 161-166. Vipin C, Idris M, Tripathi RS (2005) Field evaluation of second generation anticoagulant rodenticides in moth bean crop. 2(1), 116-119. Vipin C, Tripathi RS (2005) Bio-efficacy of second generation anticoagulant rodenticides in pearl millet-moong-moth bean cropping system in Indian arid region. Indian Journal of Plant Protection 33(2), 167-171. Vir S (1982) Varietal preference in moth (Vigna acontifolia Jacq.) for the pulse beetle, Callosobruchus maculatus Fabricius. Bulletin of Grain Technology 20(1), 3-7. Vir S (1983) Assessment of yield loss in mothbean and cowpea crops due to insect pests, and their control. 1215. Vir S (1984a) Assessment of yield loss due to yellow mosaic virus infection in mothbean. Pesticides, India 18(6), 33-34. Vir S (1984b) Screening of mothbean Vigna aconitifolia Jacq varieties against the pulse beetle Callosobruchus chinensis Linn. Proceedings of the Indian Academy of Sciences, Animal Sciences 93(1), 25-28. Vir S, Jindal SK, Lodha S (1984) Screening of moth bean cultivars against jassids, whitefly and yellow mosaic virus. Annals of Arid Zone 23(2), 99-103. 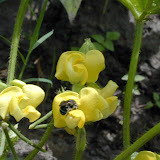 Virendra S, Sharma SK (2005) Response of mothbean (Vigna aconitifolia) to zinc and thiourea under dryland condition. Annals of Agricultural Research 26(2), 313-314. Vishnu S, Sanjita S, Mathur OP, Purohit GR (2001) Rate and extent of dry matter and nitrogen degradability of some protein sources in goats. Indian Journal of Animal Nutrition 18(1), 90-92. Vyas NL, Manjit S, Joshi SP (2003) Evaluation of locally available plant materials for production of oyster mushroom (Pleurotus florida) in arid region of India. Journal of Eco-Physiology 6(1/2), 41-43.